Free library service is available to anyone with identification. New members under 17 years of age must have a parent or guardian sign the application card. 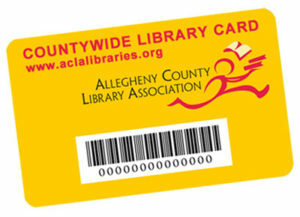 Your card is good for any library in Allegheny County. All items circulate for 3 weeks. There is no limit to how many items may be borrowed per library card. Items may be renewed twice if there are no holds on them. $0.25 per day for all adult and teen materials and juvenile DVDs. $0.10 per day for juvenile books. Borrowing privileges will be suspended on any account owing more than $10.00 in fines. Fines may be paid at the library desk with cash, check or credit card (.50 processing fee), or online with a credit card via your account in the online catalog. Renewals can be made by phone during regular library hours by phoning 412.622.1895, or by accessing your account via our online catalog. Email reminders will be sent three days before the due date for items that are loaned for 21 days, and 1 day before the due date for items that are loaned for 7 days. The first overdue notice will be generated approximately a week or 2 weeks after the item becomes overdue, depending on the type of material and the local library lending policy. It will be sent via email. The second overdue notice will be generated approximately 2 weeks after the first overdue notice, or 3 or 4 weeks from the overdue date, and also sent via email. Please remember that there may be many reasons that you do not receive an email. Even if you do not receive a reminder or overdue notice, you are still responsible to return items or pay fines for items that you check out. All bills for overdue items will be generated approximately 6 weeks from the overdue date. The bill is for the replacement cost of the overdue item.